A more powerful and luxurious SVA. The Range Rover Velar SVAutobiography Dynamic Edition is a luxury SUV with ambition. It’s a tough name to remember, but there’s a reason behind the limited edition model’s name that is due to appear in 2020. The Range Rover Velar SVAutobiography (SVA) Dynamic Edition comes from Land Rover’s Special Vehicle Operations unit and the fact that it is a Dynamic Edition indicates that it will have improved performance while still retaining all the luxury features. So, what is under the bonnet or hood? According to details released by Land Rover this week it has a supercharged 5.0-litre V-8 engine and can do a 0-60 mph/100 kmh sprint in 4.3 seconds and has a top speed of 170 mph/273 kmh. You will be able to hear it coming as it has a specially tuned exhaust; the SV Variable Active Exhaust System to be precise, which exaggerates the sound of the engine. Apparently it also reduces the Range Rover Velar’s curb weight. Furthermore, the undercarriage of the SUV carries a transmission tunnel undertray that assists the car in cutting through the air more efficiently. The Range Rover Velar SVAutobiography (SVA) Dynamic Edition’s bigger wheels than in the standard edition also help it to have better road grip and allowed the team to put in larger brakes. It’s exterior has been tweaked to suggest its bigger performance power. A new front bumper features larger air intakes, while a new grille adds to the sporting appeal and the revised rear bumper, and quad exhaust pipes hint at the model’s power. 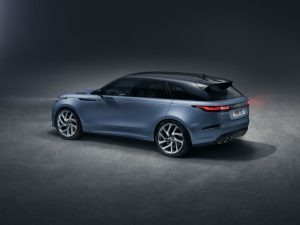 It is also the only Velar model that will be available in Satin Byron Blue, although every model regardless of body colour will have a Narvik Black roof. Inside the luxury SUV there are twin-stitched, perforated, and quilted Windsor leather upholstered seats available in Ebony, Cirrus, Vintage Tan or Pimento. It is anticipated that this will be a low volume model and that output will be around 2,000 models sold globally. And as yet, Land Rover has not announced the price, but it is likely to be in the area of $80,000. Titanium Luxury Hire has a selection of Range Rover models for hire in Europe. We provide Range Rover rental across Europe. See the Locations page for details. We can deliver your Range Rover to your hotel, home or airport. Rent a Range Rover today and enjoy Titanium’s first class service.